In some ways, John Searles reminds me of Thomas H. Cook, an American mystery writer I greatly admire. Neither of them seem to have any interest in racing through plot points to the story’s denouement. Instead, like Cook, Searles lets us get to know the characters and takes his time layering the narrative. Help For The Haunted is the story of Sylvie Mason and her unusual family. It is part mystery, part ghost story and part family drama. “Whenever the phone rang late at night, I lay in my narrow bed and listened,” says 14-year-old Sylvie, the narrator of the story. Late night phone calls are a common occurrence in the Mason household. That’s because Sylvie’s parents, Sylvester and Rose, have a very unusual occupation: they help the haunted. People who feel they may be themselves, or have family members who are, possessed by demons seek them out and the Masons help with prayer. It’s not a lucrative business, people ” only occasionally enclosed a check to cover gas or airline tickets” but it is work that the Masons, particularly the father, feel strongly about. The phone call that opens the novel is of a more personal nature, though. The Mason’s eldest daughter, also named Rose, has asked her parents to meet her at the church in town. Rose has always been difficult and on this occasion she has been missing for three days. The Masons don’t want to miss this opportunity to reconcile with their daughter so, despite the blizzard, they head to the church, Sylvie in tow. When Sylvie’s dad disappears inside the church Sylvie admits to “a prickly feeling of dread” and when her mother ventures inside to see what is taking so long, Sylvie drifts off to sleep only to be awoken by the sound of gun shots. Searles manages a tricky narrative here. The present blends seamlessly with the past as Sylvie tries to unlock some of her family’s most closely guarded secrets. There is a compelling cast of secondary characters including her father’s estranged older brother, Howie; Sam Heekin, the reporter who wrote a book about her parents; Albert Lynch, the man currently sitting in jail for the murder of her parents. Sylvie herself, despite her young age, is tenacious and resourceful. A year after the death of her parents, as the police put the finishing touches on their case against Albert Lynch, Sylvie starts to doubt what she saw in the church on that fateful night. New evidence shows that Lynch might, in fact, be innocent and it makes Sylvie question her earlier statement. But if Lynch isn’t the killer, who is? 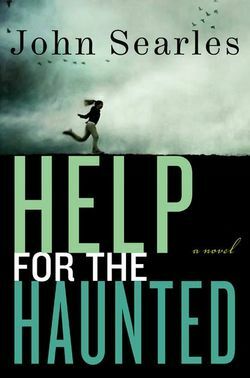 Help For The Haunted is a literary page-turner. The whodunit isn’t actually as important as Sylvie’s journey from adolescent to adult and the demons, ultimately, are more human than you might think. Great book. This entry was posted in Book Chat and tagged Book Review, highly recommended, literary fiction, mystery by Christie. Bookmark the permalink.